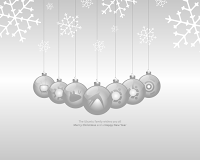 This a (late) commemorative wallpaper for Christmas including all the *buntu family distros (only official flavours). Elements of design from Gnokii at OpenClipart. Added a “frosted” version for uncluttered use.